The collective act of binding Umbilical Necklaces is a reawakening to the abundance within our consumer culture and an invitation to slow down and use what we have on hand in new and meaningful ways. You are invited to participate in this workshop as performance. Bring your own loved fibers or work and play with ours. Umbilical Necklaces are a process of unraveling wire hangers and garments worn by relatives who have passed, clothing our children have outgrown, and clothing from our former selves. This process touches upon universally shared human experiences: birth, aging and death. Wire hangers are reshaped into organic semi circles and ovals. Garments are disassembled and methodically rebound into balls of fiber to work with. The process of unraveling and reshaping is a both a mourning and celebration for what has passed - an acknowledgement for what is and an intentional manifestation for what will be. 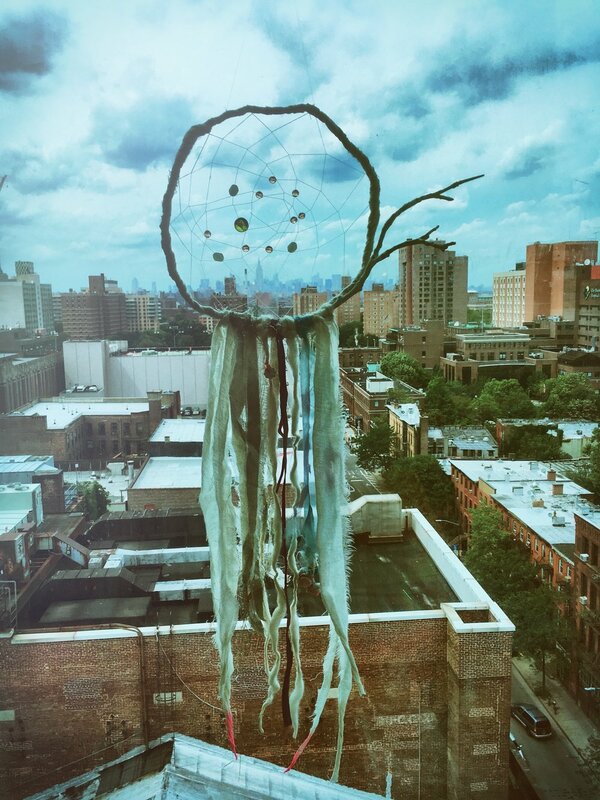 Inspired by the traditions of Indigenous Dream Catchers. Participants will be led in manifesting their own Dream Filter, composed of up-cycled materials from our urban abundance. The binding of a Dream Filter is a powerful ritual of connection to what is, what was and what intentions we wish to bring forth. All materials provided. Participants are encouraged to bring fabrics from loved ones that have passed, clothes children have outgrown, pieces from their own collection, and/or fibers from those who live elsewhere to be incorporated.